The Excel Random Sampling add-in provides a fast and accurate solution to make random samples on large amounts of data in Excel. Advanced options can be set to control sample sizes and the random selection process dynamics. Able to perform random sampling on any data type including lists with text and numeric content. Specify the number of samples to randomly extract from the data population. Choose to exclude data already sampled and filter population data for sampling to include or exclude certain values. Efficiently samples large amounts of data within a single list or across multiple Excel worksheets. 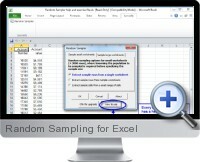 Excel random sampling is compatible with all 32 and 64 bit versions of Excel.